Transformers- Revenge of The Fallen: No film this summer is more likely to make an assload of money; no film this summer is less likely to be seen by this guy right here. 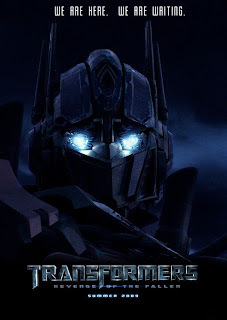 Transformers was my pick for the worst film of 2007; I've seldom seen a stupider, louder, more irritating picture. But even critics who were fairly kind to that film are slamming this one as a long (2 and a half hours, for God's sake-- EDITOR, stat! ), incomprehensible mess. Ebert wrote a wonderfully scathing review, and a follow-up essay on the film. My Sister's Keeper: Nick Cassavetes has made a couple of films (She's So Lovely, Alpha Dog) that indicate he may have inherited his dad's skill at putting together gritty, character-driven, hard-edged dramas. However, his biggest box office hit to date was The Notebook, so he'll apparently be paying the bills by making tearjerkers. Nothing in the trailers makes me want to sit through this; Orndorf's review on DVD Talk has got me thinking my gut instinct is correct. Cheri: Stephen Frears is one of our most underrated directors (his filmography includes High Fidelity, Dirty Pretty Things, and The Queen); when he last collaborated with screenwriter Christopher Hampton and star Michelle Pfeiffer, the result was Dangerous Liasons. Reviews have been less enthusiastic for this reunion, though it's still getting some respectful notices. The Hurt Locker: Kathryn Bigelow's Iraq-bomb-squad picture has a boffo trailer and is getting great reviews (Scott Foundas of The Village Voice, no easy one to please, calls it "the best American film since Paul Thomas Anderson's There Will Be Blood); but it's a movie that takes place in Iraq, so it'll probably make about four dollars.